How #Trump could actually #HELP #PuertoRico! Hey, jerkweed! Drawing comics for free every week is actually hard work--throw me a couple bux on Patreon, wouldja? Thanks! Or just buy me a cuppa joe! 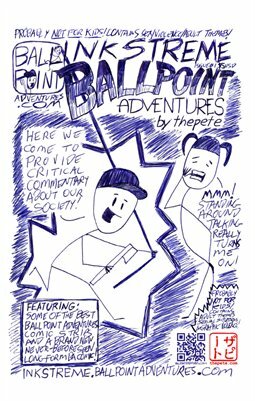 Hey, this is BALLPOINT ADVENTURES! You didn't expect Barbie to say something productive, didja? Hey, drawing comics for free every week is actually hard work--throw me a couple bux on Patreon, wouldja? Thanks! Or just buy me a cuppa joe! The one flaw in this joke is that stupid people don't care that Irma is solid evidence that Global Warming isn't a hoax. Barbie knows when a response is utterly inappropriate.